This is the life-changing Yosemite National Park tour that you’ve been looking for. You’ll get kissing-close to all the awesomeness. 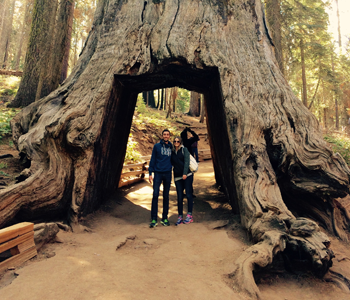 Like the Giant Sequoias! Towering water falls! (Okay, don’t kiss those.) It’s a Yosemite day tour that will be magical from start to finish. We promise. You won’t just be there, you’ll be guided by park insiders who know all the details, all the best views. You’ll learn the history. And geology (ancient glaciers carved all this—rock on!). At the right time of year, see wildflowers. Wild life. Your day starts when we pick you up at (or nearby to) your San Francisco hotel. You’ll head east across the lush San Joaquin Valley and then we’ll climb up into the craggy Sierra Nevadas. Hang on!! On the way, you’ll learn all about the area. You’ll see mining towns dating back 150 years. They’re still there!! Oh man but it gets even better. This Yosemite day tour takes you to the inspirational Tuolumne Grove with its Giant Sequoias… the largest living things on all of Planet Earth. Some of these trees are 2,000 years old!! Wow!! You’ll go into Yosemite Valley. For 4-5 hours, you’ll get inspired at Inspiration Point (get it?). 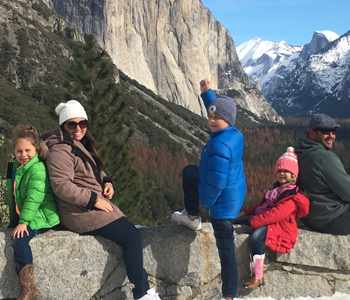 You’ll visit Yosemite Lodge and El Capitan Meadow for some phenomenal views of Half Dome and El Capitan. You will flip when you see Bridalveil Fall. And you’ll get close enough to snap a selfie at Yosemite Falls. Here’s the best part. Even though these tours run every single day, no two are the same. Your guide is that awesome (Have questions? Special requests? Just ask!) 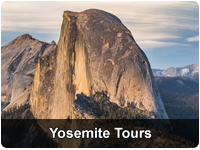 That’s why, Extranonical’s Yosemite tours from San Francisco have won more 5-star reviews than anyone! This day tour is so great, it’s backed by a satisfaction guarantee! You can’t beat it! Come aboard! We’re saving a seat for you! Your Yosemite National Park tour from San Francisco starts with a convenient pickup at your hotel—we serve most of them. Meet your local, expert guide (we call them Expedition Leaders). Learn all about your Yosemite day tour. Relax and listen to awesome stories of the region as you head east into the San Joaquin valley. Learn the amazing history of the Sierra Nevada foothills. This is gold country!!! Hug a tree! Smile! Get a picture! Enter Yosemite National Park! This is it!!! 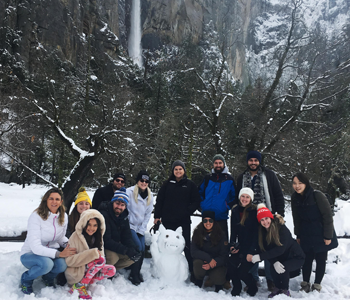 Visit Bridalveil Fall! El Capitan! Half Dome! This is some of the most amazing stuff you’ll ever see! Really! Snap awesome photos at Inspiration Point (also known as “Tunnel View”). Visit the gift shops! Munch a lunch! Take a quick hike to Swinging Bridge. It’s awesome! Or hike to Yosemite Falls. It’s the tallest waterfall in North America! Wow! Burst into tears—just kidding!—because it’s time to get back on the bus. Time flies when you’re in the most amazing place on Earth. Don’t worry: there are still more photo stops as we exit the park! Stop for a break! Stretch! Grab something to eat! On clear days, watch the sun set into California’s golden hills. Say “Dude!”! Continue back to San Francisco—with twilight views of the city. It’s twinkly!! Your tour ends right at the doorstep of your San Francisco hotel. Jump onto Facebook and share all those photos with everyone you ever knew! !